No, I am not talking about you democrats, and if you are a democrat, you are the ones that picked a jackass for a mascot. No, I am referring to old cars that are being driven by gang bangers and others that assume the lifestyle. These "donks" as they are called are divided into several categories, boxes, bubbles and Hi-Risers. As I found on Wikipedia, a Hi-Riser is a type of highly customized automobile, typically an inexpensive American-built sedan (read cheap grandma car here) modified by significantly increasing the ground clearance and adding large-diameter wheels (dubs) with low-profile tires, with fanciful custom paint-jobs and expensive audio equipment. These cars are popular with drug, pimp and hip hop subculture and other want-to-bes. Here is one example of the extreme. Why am I talking about these you ask? Good question, I think I am fascinated with these cars because on the local level there are many outrageous cars with various degrees of lifts, rims, and especially the paint jobs. Also locally there are several that are painted with various candy themes, skittles, Reece's pieces, starburst and many others. Others are painted with themes varying from Spiderman and Wolverine to Mickey Mouse and Marvin the Martian. One of the newer trends is to also fly the flag of the ghetto you are from, Cooper Road, Cedar Grove, wherever. I first encountered a "donk" last year when I saw a badly painted orange Chevy impala with Reece's piece painted on the side, candy logo and actual candies, you know, orange, yellow and brown. This was a piece of junk but it was so funny. This poor guy had painted the car orange and hand or spray painted the candies on. Wow, it looked like something Lily could have done. Soon I began noticing more and more with candy themes, there were several skittles flavors, regular, tropical and sours, with corresponding red, purple and green paint jobs. Rumor had it that all of these were drug dealers, I am sure they were spot on. They were selling candy, just of the nose variety! Over the course of the past year, more have shown up all over town, with Hawaiian punch and cartoon characters. Most that I see now are just painted with really bright or unusual colors, hot pink, powder blue, puke green. Here is another example, no candies, or flags but bright orange with a lift and in case you did not know it is a Buick Regal, woo, watch out, your grandma's car has got game. By the way, doesn't Regal mean royalty? This is by far a chariot worthy of a king, jester maybe, but no king. And no, this trend has not stopped here folks, it is spreading like wildfire, pretty soon all the grandmas, pimps and drug dealers will be driving them. The ante has also been upped to trucks now. I shot this one just yesterday at the local home improvement store. Special thanks to my wife for being patient with me as I tracked this one down. She amused me and lets me purse stupid stuff for the sake of entertaining everyone and mostly, myself. I have more pictures but they are on an old, disposable film camera and they need to be developed. In the mean time, I will continue to purse and shoot these crazy cars and post them here. If you see any that are post worthy, send them to me or let me know where they are and I will try to get them. PS: Do not let your grandmothers see this or they will be pimping out their old beaters into Hi Risers and no telling what trouble that would get them into. LMAO! 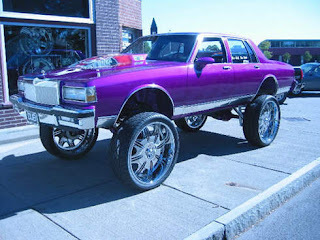 i have a private blog of hideous local cars that i see running errands-my camera is always at the ready ;-)the blog is mainly for Danny's entertainment as the junky 'fixed-up' cars and trucks are a target for his ridicule too! haven't loaded any pics on it lately as i've been working at the shop daily with Danny, and he sees every car i see on the commute to and from work... i need to update the blog and send you some pics.